UBC's Anant Parghi (left) and Assoc. Prof. Shahria Alam hold up a piece of 'green' concrete and some of the glass that helped make it. In a recent study, researchers from UBC’s Okanagan campus were able to calm a chemical reaction that has traditionally caused glass-fed concrete to weaken, expand and crack, a reaction known as concrete cancer. “Every year, millions of tons of glass bypass recycling centres and end up in North American landfills,” says Assoc. Prof. of Engineering Shahria Alam. “Like many engineers, we are interested in making smarter building materials that can give the construction industry the resources they need without necessarily having to take new resources out of the ground. Concrete cancer occurs when the alkaline properties in cement paste react with silica properties that can occur in recycled concrete additives, such as glass. 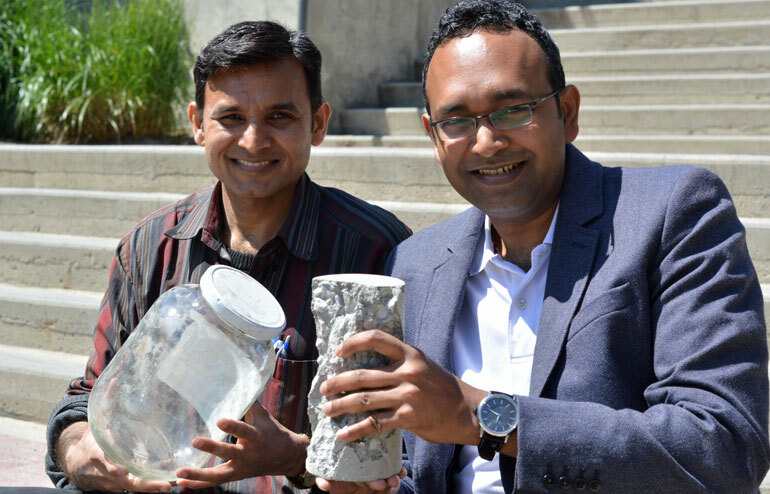 In their study, Alam and co-researcher Anant Parghi, found that by adding a water-based, synthetic rubber polymer, fly ash, and silica powder to the concrete mixture, they were able to effectively neutralize negative chemical reactions. All of the glass used in the study was taken from the landfill in Kelowna, BC and was considered waste at the time it was retrieved. The concrete additives were donated from Kelowna-based company POLYRAP Engineered Concrete Solutions. Alam and Parghi’s study was recently published in the journal Construction and Building Materials.